Online Sales Coming Soon. Contact Us for sales and service details. These industrial quality, general purpose cylinders are designed for use in a variety of applications where lifting, pushing, bending or holding may be required. Ideal for use in shop, agricultural, automotive/truck service and construction maintenance. 1. Hollow Type Cylinders - the hollow rod is ideal for tensioning applications such as wire, strands, bolts, rods, etc. When used with the head cap on, a hollow cylinder can be use as a standard cylinder. 2. Designed for use in any position. 3. Polyurethane seals and wipers reduce contamination. 4. Hardened saddles keep top bearing and plunger from jamming while the saddle grooves help prevent slipping. 5. Threaded collar and internal threads withstand full loads for maximum flexibility in fixturing. 6. Steel top stop ring protects against piston blowout and allows the cylinder to be operated safely during full stroke applications. 7. Heavy-duty return springs enable fast and consistent plunger retraction. 8. High-strength alloy steel construction with chrome-plated piston rods that resist wear and corrosion. 9. One piece copper ring cradles the piston rod and absorbs eccentric loading while providing side load protection. 10. Baked enamel finish for outstanding corrosion prevention. 11. 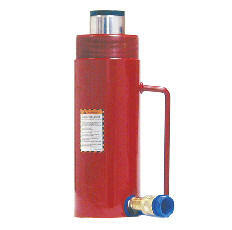 With appropriate accessories, these cylinders can be paired with either hand pumps, air pumps, or electric pumps. 12. All models come with 3/8" NPT fast-flow quick-connection coupler and dust cap. 13. All cylinders are designed with base mounting holes (5/16-18 UNC) for easy mounting on almost any fixture, and for easy set up with optional adapters. 14. Collar plunger threads and base mounting holes provide for easy fixturing. 15. Optional adapters make it super easy and cost efficient to convert our 10 ton ram to snap-type or threaded-type applications.